Yep, a few of us were there, albeit a bit unorganized. This was my first time going to any convention ever so I went with a few friend who had went and followed their lead, the first day was a bit overwhelming. First! THE WALKING! Not much of a big deal to most people, but I have to walk with a cane so the walk to the convention was bad, I made the mistake of bringing my laptop which only made things worse. I figured when we got there I wouldnt have to walk much more, but NOPE! We ended up walking around a lot but it allowed me to look at different vendors, and eat lots of food as I passed by food stands lol. I spent the first day snapping photos and giving out a few business cards to people. The second day however was much more eventful, I finally overcame my shyness and started handing out a bit more business cards, chatting and talking with people and telling them more about Fireraven Game Studios and our upcoming project “Bongo The Clown”. During Saturday there were a lot more people around the convention center and I got to take more pics with much of them. They werent the only people I met, I was given a few different cards by different people, Such as Nerdy show, It was awesome to meet the guy that gave me that card. and He gave me a nice clip to add into the Megacon Video that I will upload once I have a chance. There was also the furry card game Furoticon(Warning: Must be over 18 to view their site) I wont really go much into detail about their card game as I want to keep this post Pg-13! But I did have an a good conversation with them about their card game, and about them wanting to do game development as well so who knows. Maybe Fireravens will end up helping out with their projects or vice-versa. I Love to keep an open mind when it comes to collaborating with different game projects. The pictures from the convention have been uploaded to our facebook page at least mine are atm, hopefully soon the others might upload a few of their pictures to the page as well. An interesting note is that this convention was a pretty good success for us. I saw an increase in likes after everything was over there was even a small spike in the amount of views the site has gotten. I was happy to spend the weekend chatting and meeting new people, and enjoyed taking pictures I only wish I had taken more. Please be sure to view our Facebook page or leave a comment on this post. I am working to get back in the swing of making blog posts and trying to stay active with marketing our upcoming game and the team. This will be the first release of Fireraven Game Studios, this image was drawn up by our artist Kim Kotschi I would like to thank her for this amazing drawing, This will be the poster Image for the game, I plan to hang this around most of my town and at Megacon! So be sure to check us out!. Due to a recent development in my life I have been a bit busy with things, Sadly on March 1st, 2014. I was hit by a drunk driver while coming home to steak and shake with a few friends. It hit my side of the car (Drivers side) and one of my passengers (My best friend’s girlfriend) did not make it. On March 2nd, She passed away. I plan to do a special video for her as well as I plan to dedicate this game to her life. I will go into more Detail on FGS’s First official Game development Episode. For now I have created a Pilot and an Introduction video for all to view. Work and Development also Megacon! Well as we have been working for a long period of time, we haven’t given much information as to what we have been doing! Currently the team consists of 6 people, Adam Glass, William Hargrove, Scotty Lefland, Sanjay Singh, Kim Kotschi and Myself, we are working to get our first game released on steam by this year, and we are also hoping to be working from an office space as well. I have recently invested in getting 2 laptops for the designers cause they’ve only had desktops to work from and it puts a hamper on meetings. This will hopefully speed up development, and make communication a lot more easier. But I have to give it to our programmer who took my small prototype to a completely new level! He has been on the ball since day 1 making the game more and more better adding new features to it and working on getting it playable and re-playable. On another note our team will be going to Megacon this march so expect to see us around there! I will start posting more information about the team and the project as time goes by, I wish to hear from people soon on how the progress is going. Please forgive me I haven’t don’t development blogs in years, so this is me getting back in practice. I took the step in registering the company to protect as much as I can, I will be setting up a project within the next few months and we will begin putting out as much as we can. Sometime by next year I hope to have a physical studio for a team to work out of and for us to be doing this as a full time gig. Continue to look out for us and expect to see some changes in this site. 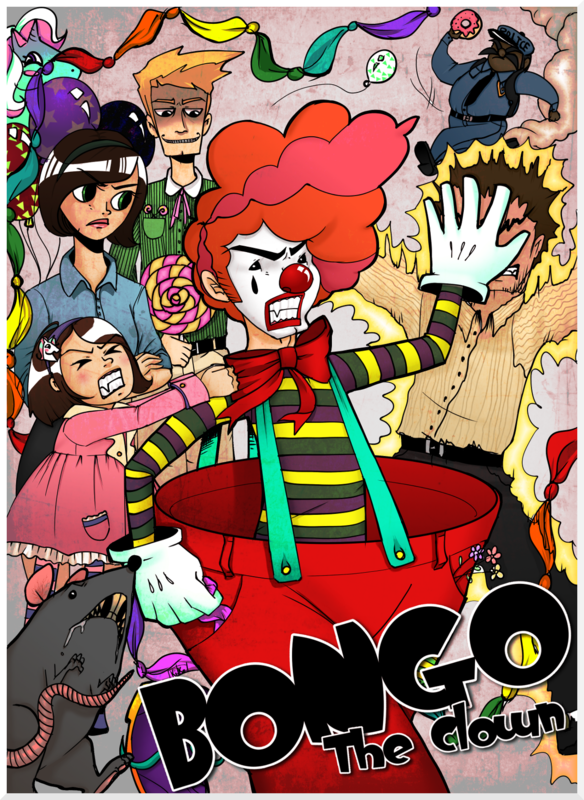 Maria Smith on Introducing, Bongo The Clown! Maria Smith on Work and Development also Megacon! Copyright © 2009 Fireraven Game Studios. All Rights Reserved.